DC Comics - Batgirl "Bishoujo"
Kotobukiya returns to one of their Bishoujo hits with a re-issue of Batgirl ! The cutest Barbara Gordon you'll ever see ! Based on a character interpretation by master illustrator Shunya Yamashita ! Barbara Gordon looks great standing atop a gargoyle base in this highly detailed 1/7 scale statue. With her long red hair and cape flowing in the breeze, Batgirl strikes a dynamic pose, perfect for display on your shelves ! 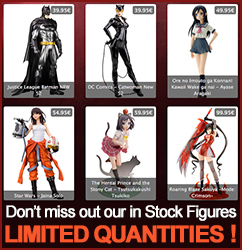 Batgirl looks great on her own and even better alongside other Kotobukiya Bishoujo statues !